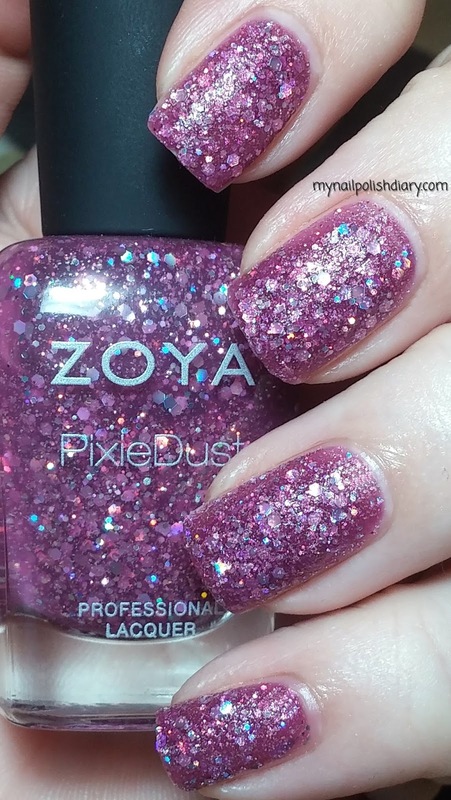 Zoya Arlo is part of this summer's Magical Pixie Dust collection. These pixie dust are different from the previous pixie dust releases. They're textured like pixie dust but they have silver holographic hex glitter in abundance. Zoya Arlo is magenta jelly base with glittery holographic awesomesauce. It's seriously textured. It was really thick and I was concerned it would not apply easily, but I was wrong. It applied really easily in spite of the thickness. It wears like a fortress! Nothing is gonna hurt this mani. It did take for.ev.er to dry though. Over an hour and it was still drying. As it dries the texture becomes more and more apparent. Overall I like the magical pixie dust finish. It's fun for something different!